The ’82 Corvette wasn’t quite one-of-a-kind, but it was the last year for the C3 body style, which had been around since 1968 and represents the longest run of any Corvette version. It’s also the last before the one model-year hiatus prior to the C4’s ’84 debut. And it features the controversial “Crossfire Injection” systembasically a throttle-body fuel-injection system that was the transition from a carburetor to true EFI. Performance-wise, the ’82 wasn’t stellar by Vette standards, but it was a handsome machineespecially in this color combo. As a bonus, Diecast Reproductions provides a replica window sticker and title for the carvery cool. 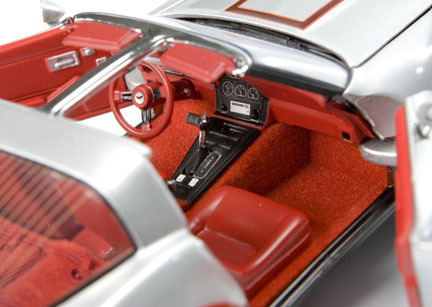 Like its other 1:24 Vettes, these are assembled by Franklin Mint, but are exclusive to Diecast Reproductions. While 1982 was forgettable throughout much of the automotive world, in Corvette country is was a watershed year. This was the last hurrah for the 3rd-generation Vette, which sported a body design that stretched back to 1968 and a basic chassis that had debuted under the C2 way back in 1963. The ’82 carried the updated rear glass that Corvettes received for the 25th anniversary in 1978, giving the car the fastback shape that became one of the signature styling cues of the “Disco Vette” era. 1982 was also the first model year to be produced at the new Bowling Green, Kentucky assembly plantan odd fact, as the new facility shut down after just that one season and remained closed for over a year to retool for the forthcoming 4th-generation car. Since the C4 was released as an ’84 model, not only is the ’82 the last of the C3’s, it is the last car before the only interruption in the Vette’s 54-year model history. The ’82 also represents two technical firsts, although not altogether positive ones from a performance standpoint. Traditional sporting enthusiasts had endured several years of overweight, underpowered Corvettes, but in ’82 they were dealt a further blowfor the first time ever the Corvette was not offered with a manual transmission. Backing the 4-speed auto was a new powerplantthe L83 350 with “Cross-fire” fuel injection. The system made 200hp just 10 more than the previous yearbut produced big gains in drivability and fuel economy. It had its detractorsmainly lamenting its lack of upgrade potentialbut in stock form it was quite competent. The C3especially the later yearsgets a bit of a bum rap from Vette enthusiasts. While it’s true that these cars trail all but the C1 in terms of raw performance, they were still among the best of their day. From a historical standpoint, this car certainly deserves to be immortalized in a premium scale model. Diecast Reproductions doesn’t stop there though. This car, like each of its limited editions, starts with a Franklin Mint casting. Franklin then applies paintSilver over Dark Claret metallicthat is exclusive to this 1000-piece run. To that it adds a full-scale reproduction of the window stickerincluding an accurate VIN and a breakdown of every option included on the car. 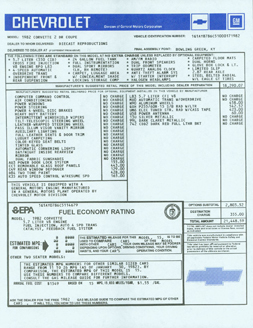 (If you’re interested, this car would have retailed for precisely $21,448.59 in full scale back in the day.) 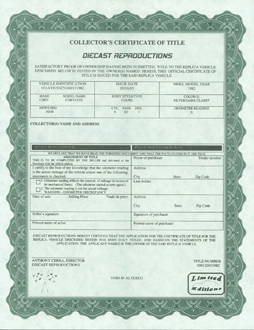 Also included is a simulated Certificate of Title printed on parchment stock. Of course these documents are merely window dressing next to the model itself, but they really add a satisfying exclusivity and authenticity to the package. choice of colors really highlights the car’s shapeit is flashy but not garish. 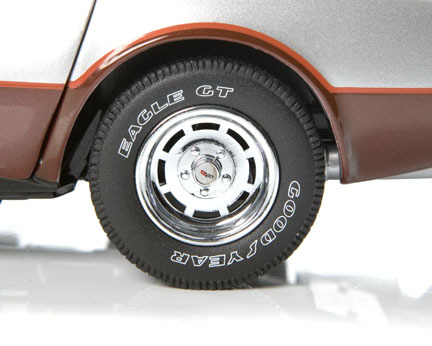 Franklin Mint assembles each model for Diecast Reproductions, so the casting is very accurate and has nice, tight gaps throughout. I wish the headlights flipped up as they do on some later Franklin Vette castings, but aside from that the body is first-rate. Paint is also excellent, with a smooth application and very fine metal flake. The black and bright red pinstripes further accentuate the two-tone primary colors. The smoked glass (plastic) roof panels are so-so; not much that could be done to improve them since they are entirely transparent, but the car definitely looks better with them put away. Interior. It’s hard to believe this color was ever cool, but then again, bellbottoms and butterfly collars were all the rage once too. The red leather interior looks like it should come with a Best-of-Journey collection on 8-track, but its representative of the car and era. Once your eyes readjust to the brightness, the detail is actually quite good and the seat texture seems very accurate. The leather wrapped wheel is has the right chunky look, and the two (only two!) pedals sprout out of thick pile carpeting. The dash uses two sticker panelsone for the gauge cluster and one for the center stack controls. Sadly, the one on the center dash had curled slightly. Under the Hood. The Cross-fire 350 is one of those engineering footnotes that doesn’t get much respect. Thats too badit surely paved the way for port EFI systems that became GM’s standard just a couple years later. 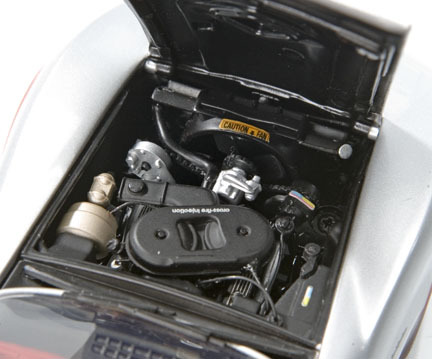 The telltale diagonal oval air cleaner layout looks similar to the aftermarket crossram manifold from the ’69 Z/28, although the reliefs cut in the center are distinctive. Its technically distinct as well; the system abandoned carbs for a pair of fuel injection throttle-bodies. Each one had just a single opening, so airflowand thus performancewas modest. Still, its 200 horses out-powered anything from rivals at Ford or Chrysler that year. This model does an excellent job replicating the engine. Finned valve covers peek from under the flat black intake and the wiring is quite intricate. Chassis, wheels and tires. 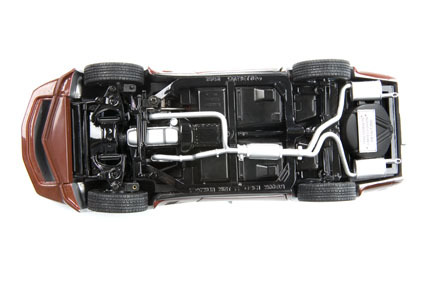 The chassis has a metal frame, to which the interior tub and suspensions are fixed. That’s both realistic and pleasant to look at. Front and rear suspensions are both sprung, although realism takes a bit of a hit in at the rear, where coil springs do the work and the transverse leaf is purely cosmetic. Paint is nice and clean, and the 2-into-1-into-2 exhaust system contrasts well. The limited edition plaque (this is car 816 of 1000) stands out clearly against the spare tire container. The replica window sticker touts the wheels as option N90 aluminum 15-inchers. The size looks right, but did they really get $490 extra for this wheel pattern in ’82? Tires are 255/60R-15 Goodyear Eagles. The sidewalls and tread are great, but the shoulders look a little square compared to the Disco Vette tires I remember from my youth. Even so, they make a fine overall presentation and the stance looks good (better, in fact than the saggy-behind angle of many C3’s. 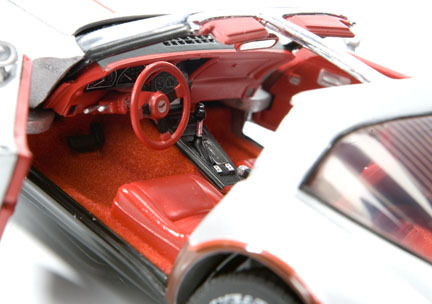 I like this model’s unabashed celebration of the subjectit dares you to deride the Disco Vette in all its glory. It may look as dated as Travolta’s white suit from Saturday Night Fever now, but back then this was the American car to have if you wanted the prettiest babe in the disco club to ride home with you. Franklin’s casting represents well, with good lines, and lots of sculpted character in the coke-bottle shape. 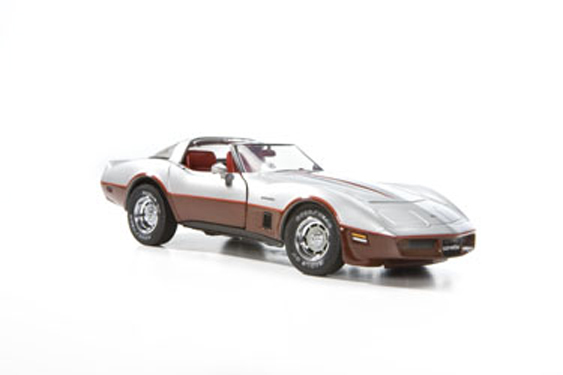 Diecast Reproductions’ choice of colors, the fact that its the final C3, and the cool little extras like the window sticker and certificate of authenticity make this one a real find for the discerning Vette collector. It may make you shake your head a little at how times have changed (and mostly for the better) since ’82, but you’ll be smiling when you do.